Murray will meet the loser of Sunday evening's match between Roger Federer and Milos Raonic on Tuesday. Plenty of time to improve and tweak. It's time to end this live text coverage, but we'll be back this evening to take you through Federer's match with Raonic. Bye for now. Andy Murray is not out of this tournament, but it is an uphill task in a group which includes Roger Federer, Nishikori and Milos Raonic. "He's got to go back to the drawing board," says Colin Fleming. Disappointing for Andy. Not what he would have been hoping for. It's a round robin tournament so he's not out but he needs to find his form. Credit to Nishikori, he never gave Andy a chance to settle. Ben Silveston: Pretty impressive performance from Nishikori! Murray certainly second-best today! Nishikori had never beaten Murray, but he has now. "Maybe the beginning a little bit tight, but I started feeling well and the second set was almost perfect," he says. "Good serve, big forehand and I was happy to win the first match. I knew he is very consistent from the baseline so I knew I had to be more aggressive than usual and that's how I won today. It's my goal to go semi-final and final." Missed any of the action? With the chapter points feature, available at the top of this page, you can jump back to key moments and relive the action - that's if you want to watch Andy Murray lose. It's not over for Murray, he can still get through. But what an absolutely fabulous game plan executed by Nishikori. Murray is going to have to win at least one of his remaining two matches. Time for some drum roll. Earlier, in our live vote, we asked who you thought would win the ATP Finals and 61% of you voted for world number one Novak Djokovic. Andy Murray was your second most popular choice with 16.7%, while Roger Federer received 16.5% of the vote. Just 1.9% of you voted for Kei Nishikori, but the world number five is on song here. Dreamy returning for a 0-30 lead and, a couple of points later, Murray nets to present Nishikori with two match points. Backhand long and Murray loses this one, but he can still go through. That's a strong hold from Nishikori and credit to him. He is now just one game away from the win. Murray, you feel, will always have a chance on the Nishikori serve simply because of the number of double faults the 24-year-old makes. An eighth of the match for 30-15 - but Nishikori dazzles on the next point, an improvised overhead volley from the middle of the court into the corner for a 40-15 lead. Nishikori comes through, holds, and stops the rot. I've spoken a bit about momentum. From 2-3 down in the first set Nishikori had all the momentum but now the shoe is on the other foot. Murray received treatment on his left calf during the changeover. "It felt tight a couple of games ago," he told the trainer. But the Scot is now back on the service line, and he rattles off a 124mph ace for a 40-15 lead. Next though, Murray screws a backhand wide and shakes his head in disgust, but there's little reason to worry as the Scot fires down another ace to level the match. He's back in it. Minutes ago he could have been 4-0 down but it's now back on serve. We've seen him do it so many times, making his opponent play a difficult ball. How will Nishikori respond? He is in control, but his more experienced opponent is breathing down his neck. Oof! A mistake from Nishikori as his lunging volley plonks into the net. 15-30. Murray on the up? Yes. Nishikori goes long - double break point Murray - and another error at the tape from Nishikori allows Murray to break. His best service game of the match and chance now to put pressure on the Nishikori serve. A flamethrower of an ace from Murray to start proceedings. The Scot can't afford anymore blips or dips. A second ace of the game moves the Scot to 40-0 and another unreturnable serve sees him over the line. One of his more comfortable service games. Nishikori has this match by the scruff of the neck but Murray has had chances on the Nishikori serve and Nishikori is still serving at just 46%. He's in control but not serving well. Patcik Jack: Nishikori is really flying here. It will be an early test of Andy Murray's character to get back in to this match. A monologue on the baseline from Murray as Nishikori eases to a 30-0 lead. The Scot isn't returning with his usual aplomb and he nets once more, gifting Nishikori a 40-0 lead. But errors creeping into the 24-year-old's game, a volley wide, a double fault...can Murray take advantage? Nope. Murray skips from side to side, fetching and retrieving, but can do little but watch a Nishikori forehand winner fly by. Murray has only won one point on his second serve in the second set. Respect for the Nishikori serve. It's only the second game Murray has won in the last 45 minutes but it was a must-win game and he got the job done. So now what? First point to Nishikori. A shake of the head from Murray. Oh boy. But perhaps we shouldn't doubt Murray as he hits a thunderous forehand winner to level at 15-15. From 30-15 to 30-30 as Nishikori pounces on an 89mph Murray serve, whacking it down the line and celebrating with a clench of the fist. Circus tricks at the net - Nishikori the one who comes up with an irretrievable volley for a break point. But let's not talk of Murray's demise just yet because he fires down his third ace of the match. A second break point comes Nishikori's way, the man from Japan forcing Murray on the backfoot. What a brilliant game this is. A backhand winner down the line from Murray increases the volume inside the O2. But from high to low as he coughs up a double fault, before the Scot makes amends with a canny drop shot to end a fabulous exchange. Deuce. Advantage, Deuce. Oh my giddy aunt... But, finally, Murray turns the screw to win his first game in what seems like an age. Murray is in real trouble here. Nishikori has never beaten a British player. He lost to Dan Evans at the US Open last year. He looks in complete control though. Murray needs to start his comeback here otherwise the match could run away from him. Nishikori provides his opponent with some assistance, double faulting - his sixth of the match - to gift Murray a 15-30 advantage. But the lights have gone out for Murray, with some iffy returning allowing Nishikori to hold once more. Murray holds up three fingers towards his chair. This match is being dictated by Nishikori. He is stepping up on the baseline and putting Murray in a defensive position. Murray is going to have to try and change that. Impressive stuff from Nishikori, whose backhand down the line kisses the whitewash, levelling the game at 30-30. The 24-year-old collects a break point, some members of the crowd yell words of encouragements to Murray, but there's nothing anyone can do as Nishikori conjures a cute drop shot, leaving Murray helpless on the baseline. "Murray looked like he had rid himself of the habit of letting leads slip in recent weeks but an early break and the chance to really grab the momentum went begging there, and after a very nervous start Nishikori found his game. Defeat here will not be terminal but with Federer and an in-form Raonic to follow, the loser faces a tough task." Easy peasy. A straightforward hold to love for Nishikori. It took a bit of time to get going. Nishikori will look at the stats and see only 40% of first serves in and think he must be doing something right. Both players need to up their serves in the second set though. Murray was a break up in this set, but he must now hold to stay in it. A wry smile from the British number one as he goes long, gifting Nishikori a 15-30 lead. Wow! Incredible from Nishikori and the crowd are whopping and hollering. Nishikori returning with the speed of a cobra's tongue, hitting a winner down the line to bring up two break points. Murray saves one, but gives up the fight with an iffy drop shot. The debutant in control. That's a great hold. A tremendous match this to open up the World Tour finals. Last year there were no accredited journalists from Japan covering this event. This year there are 42. They believe he can get to world number one and why not? Murray's eyes widen as he senses an opportunity to pounce on a Nishikori second serve, but he messes up the return and shrugs his shoulders and points towards the net, questioning how he failed to take that opportunity. Winners now pinging from Nishikori's racquet - and he comes up with a second serve ace down the middle. Cheeky. But Murray, scrambling, lunging, drags the game to deuce only to later be undone by Nishikori's brilliance, the highlight a backhand volley into Murray's feet. The 24-year-old holds and this match is hotting up. Murray to serve to stay in the set. For the first 20 minutes they were finding their feet and in the last 15 minutes, the error count has dropped and the winners are starting to flow. Fine serving and volleying from Murray as he ekes a 30-15 lead against an opponent who is gradually finding his groove. Brutal stuff from Murray on the forehand and, at 40-15, he's nearly home and hosed. The Scot ends with a classy ace wide and walks towards his chair for a change of racquet. Neither player is going to serve through the other because they are both so good at returning. So they've got to look to keep their first-serve percentage high. Nishikori is 38% on first serve. It's going to be a long day at the office against Murray serving like that. At 30-30 the game is evenly poised, but it is Murray who nicks a break point thanks to a super return. Nishikori, though, responds by pinning his opponent near the tramline, forcing Murray to eventually net. Deuce. Advantage. Deuce. Neither player at their best. Nishkiori targeting the Murray backhand in a mammoth 23-shot rally, seeing off the Scot with a fabulous winner down the line. Bravo! And another crackerjack winner from Nishikori concludes the game. Murray has looked the stronger in these opening exchanges, but he goes through one of his dips at a crucial moment. Sloppy errors from the Scot in this game against an opponent who is now stepping in from the baseline. The world number five collects three break points and Murray throws in the towel with a double fault. The Scot punches his temple in frustration. We saw in the last game Murray coming in on second serve. It's got to be the right tactic because he's one of the best returners of serve in the world. Murray has been looking to be aggressive and the double fault on break point was the by product of that. Two easy points for Murray for a 0-30 lead. The duo then become embroiled in a baseline slug-fest, which ends when Nishikori nets. Three break points Murray. Danger ahead for Nishikori. The former Wimbledon champion challenges a call - Hawkeye shows Murray was out by some distance. One break point saved. Aggression from Nishikori as he steps towards the net and smashes an overhead beyond Murray. Two break points saved. But his resistance folds. A double fault. Murray nips ahead. Great defence from Murray and Nishikori left to rue the missed opportunity at 0-30. Spectators stop waving at the TV cameras, the roaring music is switched off and the players emerge from the changeover to start battle again. Two simple points for Nishikori gives him a 30-0 lead but Murray bounces back. He works Nishikori this way and that - the US Open finalist missing an opportunity to kill off Murray with a volley, so the Scot responds with a cheeky lob which does the job. An ace for a 40-30 lead and will the world number five rue not making the most of his chance in this game? Murray respects Nishikori's court speed. You can tell that by the way he's trying to climb up and over his second serve. We'll see how long that tactic lasts. Murray stepping in from the baseline, showing some aggression, but it's a wild return into the tramlines at 30-15 which allows the world number five to move to within a point of holding. The Scot, though, drags his opponent to the net and Nishikori pushes a volley wide. 40-30. Some razzle-dazzle at the net, both players missing opportunities to end a series of quick-fire exchanges before Nishikori nets. To deuce we go. Nervous times for Nishikori. He slaps a routine forehand into the tape, gifting Murray a break point. Decibels rise inside the 02. But Murray fails to take advantage. Nishikori scrambles free, but he must improve his first serve. Getting the first hold under your belt, in a championship like this, is a good way to start. Now Murray has to see if he can make some inroads into Nishikori's serve. Big serving from Murray and the crowd heartily cheer every point. A confident opening from the Scot who holds to love with little fuss. A Murray backhand goes long so it's first blow to Nishikori, who goes on to open up a 30-0 lead. But the US Open finalist coughs up a double fault - his first serves aren't hitting the target in this opening game. A fierce forehand from Nishikori, though, admiring applause from the crowd, and he's up 40-15. Another double fault. Another chance for Murray. 40-30. But the Scot goes long once again and it's a nerve-easing hold for the debutant. The warm-up is over. The players are in position. The umpire calls for quiet. Here we go. Is it the best tennis selfie ever? Not many spring to mind, I suppose, so maybe Mr Berdych is right. You would have thought playing six weeks in a row Murray would be a little fatigued. But I spoke to him recently and he said it's the first time he's done that since he was 18 but that he's feeling fine. Nishikori's game is built around fantastic speed around the court and great ball striking. Murray has won all three games between them but they haven't played for around two years so I don't think you can read too much in the head-to-head. Ben Roach: HERE WE GO! Come on Murray! Gill Taylor: Good luck @andy_murray, we're all behind you. Andy Murray emerges through the dry-ice fog to warm applause. He looks a little bemused as the spotlight focuses on him, although he's used to the razzmatazz of the O2. Nishikori joins him on court and the pair make their way to the net for the coin toss. Who will serve first? Nishikori. A little bit of a warm-up before we get under way. Murray may be on top in the head-to-head against Nishikori, but they have not met since the early weeks of 2012 and a lot has happened since then. Here are some stats on the improved Nishikori. - Nishikori captured four ATP World Tour titles in six finals this year, becoming the first Asian player to finish a season in the top 10 of the Emirates ATP Rankings since 1973. - Nishikori won a personal-best 52 matches in 2014, including nine against top 10 opponents. The 24-year-old had a total of nine top 10 wins in his previous six years on Tour. - Nishikori made history by becoming the first Asian singles player to qualify for the ATP Finals. "Murray being here, he needed to win matches and did it. There were so many things that had happened, he just needed matches, he recognised it and jot the job done. Three tournament victories in six weeks. It's remarkable." A flick through the record books suggest Murray has the upper hand over his opponent today, beating Nishikori in their three previous meetings. The 24-year-old US Open champion is making his ATP Finals debut so will Nishikori's inexperience be to Murray's benefit? "That can work both ways," says the Scot. "Someone who's inexperienced can come out and struggle with nerves, the occasion or the crowd. And sometimes it can happen the other way, where people come out and just love it, play great, feed off the atmosphere, feel there's no pressure and just go for it and feel very loose and free." 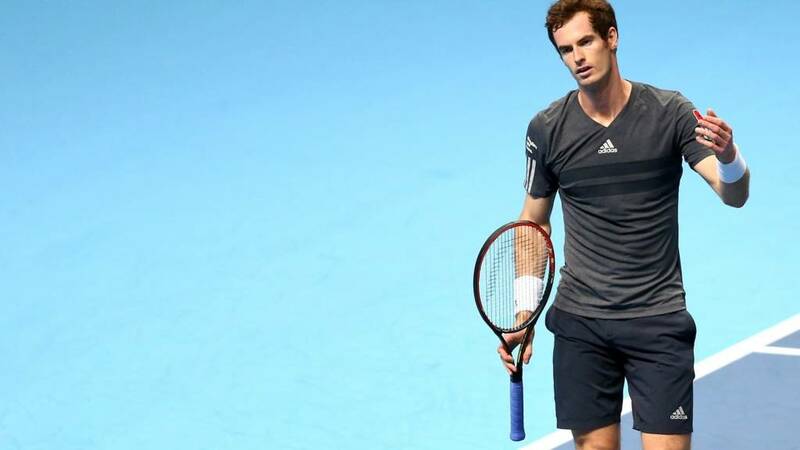 Murray missed last year's grand finale at the O2 as he was recovering from back surgery. His return to something like his best has been gradual - this summer he dropped out of the top 10 for the first time in six years - but he has shown in the last few weeks that he is on course to compete with the elite once again. Who will win the season-ending finale? Participation is required in today's live text, which is a good thing. The question we're asking in our live vote is: which player do you think will be hoisting the trophy aloft at the O2 a week from today? You can vote once for any of the eight competitors - using the vote module either at the top of the page or on the right hand side of the page - depending on what device you are using, and you will also be able to find the vote terms and conditions there. The vote closes at 15:00 GMT and we will announce your favourite choice later in the day. "After London got a drenching on Saturday, the sun is shining brightly enough on the North Greenwich Peninsula this afternoon to show up the scruffy patches on the big tent that is the O2. It's officially the penultimate year that this venue will host the ATP end-of-year shindig (although it could yet be extended beyond 2015), so any chance to watch the likes of Andy Murray or Roger Federer in autumnal London has to be grabbed and we're expecting pretty much sell-out for both sessions. "First up, Murray will reacquaint himself with the UK crowd against US Open finalist Kei Nishikori, and Murray's friend and Davis Cup team-mate Colin Fleming is in confident mood: "Andy in two." It's been a non-stop six weeks for the British number one, but he has some more lung-busting work to do before he can rest and recuperate for next season. In his first round-robin match at the ATP World Tour Finals, Murray will play US Open champion Kei Nishikori. The match starts at 14:00 GMT, it's live on BBC Two and this website and promises to be a humdinger. Stand by. Six back-to-back tournaments. Shenzhen. Beijing. Shanghai. Vienna. Valencia. Paris. Twenty victories. Three titles. It was touch and go, but Andy Murray has made it to Greenwich and is ready for the Final Showdown. And if Murray is ready then so are we.